Reality TV star Charlie Boorman on DL BS AL 220. 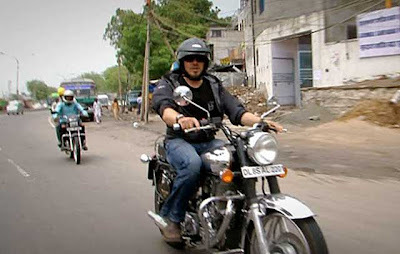 "I noticed the registration number of the Bullet he was riding in India looked familiar! It's the same bike I borrowed from the shop in Delhi to ride to the Himalayan Snowline in March this year. The bike was well and truly run in for Charlie!" 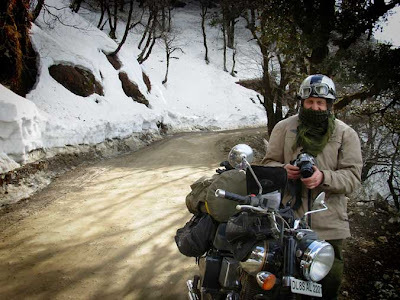 Paul Grace with the same bike near Jalori Pass a few months earlier. With so many Royal Enfields in India, the odds against this seem very long, indeed. Grace is the author of No Way to Treat a Classic British Motorcycle, about racing a home built Royal Enfield scrambler in the UK. His latest effort, including the story of the ride to the snowline, is The Classic Motorcycle Diaries. Here he "invites you to take a peek inside the private diary of a classic motorcyclist... from local shows, the big events, foreign travel and trail riding." "This book is all about enjoying your motorcycling, enjoying life to the full, getting out and about to experience new places; the solitude of the ride and the companionship of friends," Grace writes. "There should be something here for everyone." I have a copy of Paul's No Way to Treat a Classic British Motorcycle, it is an excellent read. The Motorcycle Diaries is on my Yule Wish List!